You've found this page by scanning the QR code on one of our business cards. We have a little reward for your diligence. Available only here is a Soaring Rhino original print-and-play card game. Every thing you need is here. Have fun! The game consists of 18 cards. There are 3 PDF files that contain the card images. Download the files, print them out on card stock Or, do what we do for playtesting. Print them on regular paper and sleeve them with a card from another card game from which you have many duplicate cards. Either read the rules below or download them and start playing. OBJECT: Be the first player to win three hands. CARD DESCRIPTIONS: There are 18 cards in the Soaring Rhino deck. The deck is made up of 3 suits (logos) numbered 1-5 and three special cards. The three suits were the finalists in Soaring Rhino’s quest for a logo. The suits are labeled A, C, and E.
The special cards are as follows. Set aside two cards face down from the deck. These cards will not be used this hand. Deal 4 cards to each player. The players set aside one card face down from their hands. These cards will not be used in this hand as well. The players then choose one card from their hand that they would like to keep. The other two cards are passed clockwise face down to the next player. Players then pick up the two cards that were passed to them choose one they would like to keep. They then pass the remaining card clockwise.to next player. Players should now haves hands of three cards. The players pick one card to play and place it face down in their play area. Once all players have placed a card they are simultaneously revealed. The winner of the hand is now determined. The highest number card wins the hand. Note that the special “Downer” cards have a value of 3. 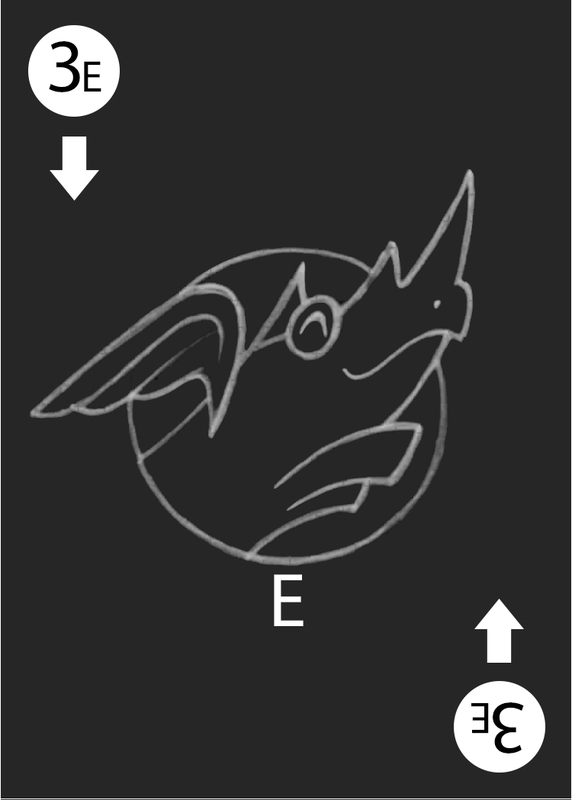 If there is a tie with value of the cards, the suits break the ties in the following order: logo A beats logo C and logo E, logo C beats logo E.
Soaring Rhino - when played this card is considered a higher value than any logo C or logo E card. It is considered a lower value than all log A cards since logo A could be considered its ancestor. Logo C Downer and Logo E Downer - These cards are a value 3 of their respective suit They are considered a higher value than the regular 3 card in their suit. When these cards are played they also signifies that the lowest value card will win the next hand instead of the highest. Ties are still resolved in the normal way using the suits of the cards. WINNING: If a player has won three hands that player is the winner. If no player has won three hands, shuffle all the cards and start a new round. Only this time pass the cards counter clockwise. If more rounds are necessary alternate the direction in which the cards are passed. Set aside 3 cards at the beginning of a round instead of 2. Deal 5 cards to each player to start the round. Players discard a card and draft cards as in the 4 player game. Players will end up with a 4 card hand. Play continues like the 4 player game. First player to win 3 hands wins. Play as many rounds as necessary. Deal each player 4 cards and deal two piles of 4 cards to the left of each player. Players discard one card from their opening hands. They then pick 2 cards to keep and 1 to pass to their opponent to keep in his or her hand. Each player now takes the pile of 4 cards on his or her left and picks one card to discard and one to keep. Each player now takes the remaining 2 cards to his or her left and discards one card and keeps the other. Players now have a hand of 5 cards. Players play out the round simultaneously playing cards as in the 4 player game. Whichever player wins the most hands wins the round. The first player to win 3 rounds is the winner.